Torrential rain forced the Drive Sober 125 from its Friday start to a Saturday afternoon green flag but the weather did not stop Eddie MacDonald from posting a fantastic second place finish in the K&N Pro Series East final season race. Rain washed out practice and qualifying so the field was set by the rulebook with Eddie Mac starting 23rd in the 31- car field. A pit lane penalty during the competition left the team wondering “What if” after the race. The second place run was the Grimm Construction/Multiple Sclerosis Chevy driver’s best performance of the five races run in the series of the fourteen scheduled events. 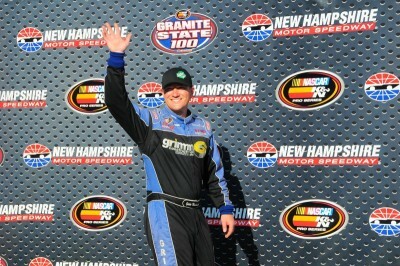 Eddie Mac scored two top tens, a sixth at Bristol and a ninth at New Hampshire Motor Speedway. Eddie MacDonald began his busy weekend with a ninth place run in the NASCAR K&N Pro Series East’s United Site Services 70 Friday night to kick off the Sprint Cup weekend. The Rowley, Mass. 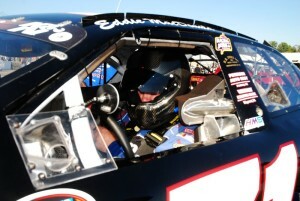 veteran racer then changed fire suits to compete in the Sprint Cup 5 Hour Energy 301 on Sunday. 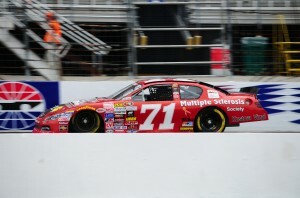 Eddie MacDonald powered the Grimm Construction/Multiple Sclerosis Society Chevrolet to a hard earned sixth place finish in the NASCAR K&N Pro Series East Pittlite 125 at Bristol Motor Speedway as a companion race with the Sprint Cup Series. The Rowley, Mass. veteran started his 183rd race in the series and took the green flag as the defending champion of last year’s event. A flat tire on lap 49 appeared to quash any hopes of repeating the win but Eddie Mac and the crew never gave up and rallied from the flat and 24th restarting position to make his patented charge to the front. When Eddie MacDonald takes the green flag to open his NASCAR K & N Pro Series East season at Bristol it will be as defending champion after posting the impressive win last year in the Pittlite 125. The Grimm Construction/Multiple Sclerosis Society Chevy piloted by the veteran racer started 13th in the event last season and had the crowd on its feet as Eddie Mac drove to the front in a door to door battle with Ben Rhodes to lead the final two laps for the win. The Rowley, Mass. driver is entering his 15th year in the series and will start in his 183rd race with hopes to repeat last year’s performance. The American Canadian Tour opener at New Smyrna Speedway in Florida will feature three nights of racing as part of the World Series of Asphalt Racing with Eddie MacDonald ready to participate in the inaugural American Racer Challenge Cup. The Cup Challenge is slated to take the green flag for two 100 lap events on Monday, February 16 and Tuesday, February 17. The ACT cars will also be in action on Sunday, February 15 as a stand-alone 100 lap event made possible when a racing series cancelled their participation. With the decision made to race a part-time schedule after winning at Bristol, Eddie MacDonald and the Grimm Racing team focused their effort on preparing the best possible car for the best possible finish. On Friday night, the Grimm Construction Chevy drove from 16th in the 30 car-field to fourth place in the final race of the NASCAR Pro Series East season in the Drive Sober 150 on the “Monster Mile” at Dover International Speedway. Eddie Mac’s impressive record over the final four races of the season began with an eighth place run at Langley, followed by a second at New Hampshire Motor Speedway, a sixth place in the East West combination race at Iowa Speedway, and finally the fourth place run on the fast, high banked mile oval at Dover. The team ran ten of the 16 race schedule posting one win, three top fives, and six top tens.